Premier says that the Zebedee well (14/15b-5) in PL004b (Premier 36 per cent equity) discovered 81 feet of net oil-bearing reservoir and 55 feet of net gas-bearing reservoir. The well penetrated multiple targets in the Cretaceous F2 and F3 formations with a total hydrocarbon net pay of 136 feet. The pay is primarily located within two F2 sands: •The Hector sand, which contains 55 feet of net gas pay. 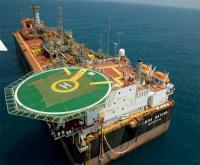 •The Zebedee sand, which contains 79 feet of net oil pay. No oil-water contact was observed in Zebedee. The reservoir at both the Hector and Zebedee intervals is of good quality and the above results are in line with prognosis. Good oil shows were recorded at the deeper F3 targets but at this location the sands are not well developed.